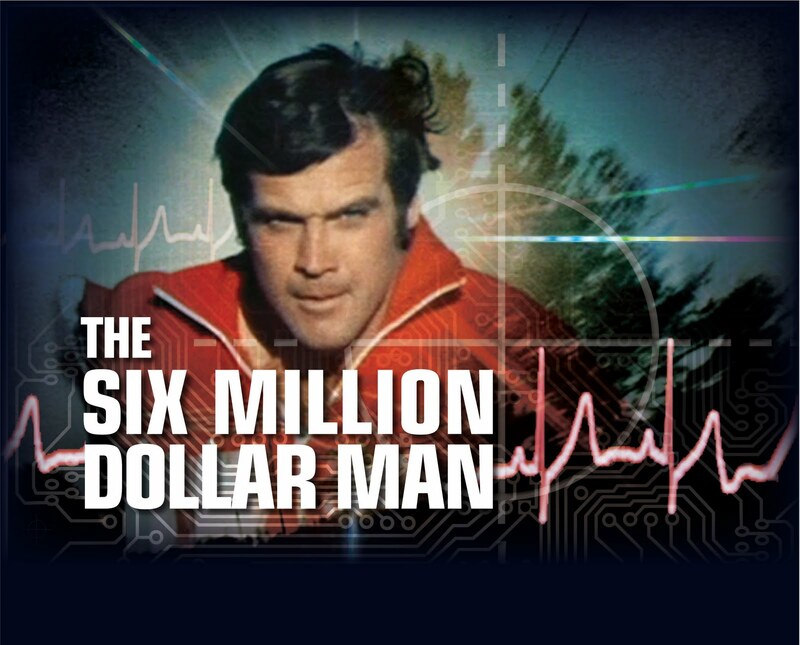 The Six Million Dollar man 40 years on. Wearables, Smartphones, 3D printing. Cost to you <$100k! As a teenager in the 1970s I loved Steve Austin, the astronaut who crashed and was rebuilt. Remember the tag line “Gentlemen, we can rebuild him. We have the technology, the capability to make the world’s first Bionic man”! It captured my imagination and has come to the front of my thinking now as I consider the possibilities of using technology to compensate for the different disabilities affecting people today. Perhaps we can’t replicate the eagle-eye zoom or the leopard-like speed of Lee Major’s character, but we can certainly bring functional replacement or complementary devices and applications to bring the astronaut-specific re-build of the 70s down to a very affordable level today. The price of electronic components is continually falling, fueling the consumer electronics boom. Smartphones, and their associated explosion of applications, leverage the mobile network and the cloud computing phenomenon to deliver a wealth of apps both mainstream and specific to certain conditions, often free or at a minimal charge. On top of this comes the wearables revolution: watches, bracelets, eyeware, hearing devices, patches and exoskeleton limbs. 3D printing also means that the manufacturing of specialist devices is literally at the push of a button and can be taken to the most remote part of the world, delivering prosthetics to Africa at an affordable price point. So how does the $6 million (not even allowing for inflation) look today? What gadgets, software and services could we pluck from consumer electronics retail outlets, apps stores and the medical community to build our modern-day bionic person? There are, of course, some very expensive options such as retinal implants which still cost $100,000s plus complex surgery. However, most of the shopping list is literally off-the-shelf, or even off-the-printer. The individual will need a subscription to a mobile provider, and probably also a link to their home WiFi, to enjoy the luxury of controlling the various household devices and services in the smarter-home environment; and, outside of the home, to link with the smart village, town and city services that can also complement the items in terms of navigation, linking into public services as well as the broader business community. The e-health perspective also needs to be built into the thinking. Some of the devices will link into social and e-health services. Some of the information loops could potentially be to doctors and carers without the individual even needing to be involved. In effect, multiple information loops will feed off and to the individual, whilst improved monitoring and reduced cost of maintaining contact will help fund installations where required. Steve Austin was funded by the US government in the TV show. In the case of a person being disabled through an accident, insurance would doubtless be involved, as would the medical authorities. Most of the items here are off-the-shelf and affordable for a vast swathe of society, not just limited to astronauts! The world’s billion disabled people (source WHO) will have an increasing chance of joining in the digital revolution at home, at work and in society as a whole if we all help bring it to their attention. We also need to educate other relevant parties – family and friends, doctors and governments to name a few. In the year that we all went Back to the Future, it just goes to show that time spent watching TV as a teenager wasn’t wasted. In Thunderbirds and Joe 90, Gerry Anderson predicted video mobile phones, Telepresence and brainwave transplants, and don’t forget the crew of the Starship Enterprise had mobile devices. If you want to predict the future, keep an eye on the TV! What tech is out there for disabled people? Recent interview with Telefonica about accessibility technology available today and in the future. I’m not the one in the bow tie…. You’re blind: How do you ‘read’, join in social media and find your way around, let alone run a business? Picture the scene: a blind man walking down the street moving white stick to and fro. He is muttering to himself while clicking a small black thing in his left hand. What is he doing? Actually, he is running his business, doing email, messaging, reading documents, checking-in for his flight and working out the best route using bus and tube to get to the airport. The black device is a mini keyboard, controlling the iPhone in his pocket and it is talking to him via his in-ear Bluetooth device…. Having been registered blind for over 30 years, I am accustomed to the regular question about how the hell do you run a business? I thought it worth while to put this down in writing both as a record of how things stand in 2015, but also as evidence of how my world has changed since the days of cumbersome magnifiers, papers being sent off to be recorded, and very clunky interfaces with early PCs. iPhone 6. This is my main means of consuming content and keeping up to date using the built-in Voiceover feature, (not Siri) as a screen reader that describes to me what is on the screen. Add to this larger than necessary device (the screen size is irrelevant to me) is a small mini Bluetooth keyboard, the RiVo, which I use as a remote control to the iPhone (leaving the phone in my pocket or bag) and a Plantronics Bluetooth earpiece. Lenovo laptop with Windoweyes and Zoomtext: I still use a laptop for main content creation such as this blog. This is now simply on account of the fact that I like the feel of a full old-fashioned keyboard and a large screen magnified to make me feel I am still working properly! There are no specific built-in applications on the laptop beyond this add-on assistive technology. Updates to Windoweyes and Zoomtext can often cause problems because their interworking with either the hardware from Lenovo or the Windows operating system is a continuous struggle. Standard TV: On the main TV in the house I do insist on Audio Description being turned on so that I can better follow those tricky dialogue light films and programmes. The verbal description woven in between the actual dialogue often enhances the programme for all the family members – try it for yourself sometime! Victor Stream Reader from Humanware: This is the one specialist device I use. This no-screen device has very tactile buttons, long battery life and stores my talking books from Audible along with podcasts and access to live streamed radio and some Internet. BBC Weather: simple and really useful when travelling around although not always accurate! British Airways: for managing flights, getting mobile boarding cards – however, the latest version has lost some of its accessibility features and says ‘button’ an awful lot of the time! Hailo & Uber for taxis both work well once you have struggled through what needs to be input, when! RNIB Overdrive: for access to the library of talking books and magazines! Lire: not really a specialist app but it is a simple RSS app that scans the web for news feeds from your favourite sources. Using the RiVo mini keypad does make navigating the iPhone a lot easier. It also makes typing easier. My preference is using it in the old T9 format, the one you would have used for text on your old Nokia phones. However, it does have a small QWERTY setting but I haven’t gone there. Using the iPhone with keyboard and earpiece does mean that I can carry on doing email, listening to content, while walking along carrying my white stick. I suspect this is a little like people using their phones while driving but it does make my travel time walking, being driven, flown or sailed, a lot more productive and interesting. As you may gather, I am close to dispensing with the services of a laptop if I can get a high quality full QWERTY keyboard that fits my aging fingers and suits my typing style! I would still plug it into a big screen in the office to give me the option of magnifying as and when necessary. With most content now being available digitally and via the web or an app, I can consume and create content almost as readily as a sighted peer. Spreadsheets do pose a problem, as does Power Point. So, as with the apps world, I do draw on some human sighted assistance when this poses a problem. The good news is that barriers are coming down, the more digital society gets, the more I should be able to join in on an equal footing. Straddling different industries as an analyst raises some fascinating anomalies. Telecoms, Networking, IT & Media are, like the US and the UK, often divided by a common language. Some interpretation is often required when talking about managed services, multi-channel, multi-screen, let alone Customer Experience. And, each industry believes it holds the upper hand when it comes to the convergence of activities. Listening to recent presentations from different quarters, I am also reminded that the emerging series of ‘eco systems’ also raises the issue of the heavy weights coming into the converged digital world along with their associated ‘size 9 egos’. Coming from a telecoms background, I am only too familiar with the accusations thrown at the telcos of being arrogant about adjacent markets. Cloud is the perfect example: the telecoms and networking industry keep telling us that cloud is nothing without the network. Well, to take a leaf from the politicians’ book, a little humility is required. Cloud is nothing without the virtualisation contributions of storage and processing, let alone the ability of applications and content to render easily across the different networks, data centres and devices. Arguably, the network is increasingly nothing without the wealth of apps, devices, sensors and computing power sitting in data centres around the globe. Hence, other industries, and indeed many within the telecoms industry, see the networking piece as the necessary evil that links the world together. New egos are, of course, emerging with the breakdown of traditional markets. The OTT players are the obvious ones with their global reach and advertising, retail or disruptive business models. At the same time, other players from IT and broadcasting are also adjusting their positions to leverage the digital economy. Even traditional network equipment players are shifting focus and building network operation centres , orchestration tools and services which will potentially bring them into conflict with the emerging telco position. When analysing any aspect of the emerging digital world it is, to quote To Kill a Mocking Bird, necessary “to stand in the shoes” of the other party before being too judgemental. It means that not everyone can bring their ego to every situation. From a telecoms perspective, this raises the issue of ‘wholesale’ and a new approach to channels. Priming every service to the customer in a consumer or business environment is not realistic. The customer will increasingly choose their preferred channel: larger MNCs will work with their preferred integrator (sometimes telcos), SMEs will often choose their favourite local, similarly sized, industry oriented partner and consumers will often lead with the core provider of their core entertainment element. This is not to say that telcos don’t have a major role behind the scenes. The linking of all of the supporting services, analysis of activities, hosting of services in public and private clouds and overall management and orchestration of all of these moving parts, all represent valuable contributions to emerging business models. If a company is to be truly customer centric, then it must be prepared to bury its ego in its Go To Market strategy and work with partners to build the end user experience.